On Monday, April 2, the Woonsocket City Council will meet at the high school to vote on a supplemental tax bill representing a 13% increase and intended to bring in a quick $4.3 million in revenue. Woonsocket’s financial troubles have been somewhat unique in recent Rhode Island history in the degree to which a tax increase has rushed to the front of proposed solutions. In large part, that’s a function of the speed with which the city has had to react to news from the school department that its projected surplus had transformed into a multi-million-dollar deficit. Only a new tax bill or employee cut would rapidly enough to meet the looming deadline for action. The latter would affect a smaller number of people and run the risk that they’ll simply stop working. The city has also experienced several years of large deficits on the school side, which have brought concessions from the largest labor union in town, that of the teachers. They now pay 20% of their health insurance premiums and carry a $500 deductible. Their pay has not gone up as much as Rhode Island practice has usually ensured. Additionally, the fact that the schools are running “paperless,” as City Council President John Ward put it on the Dan Yorke Show recently, evokes the image of teachers spending their own money for supplies. 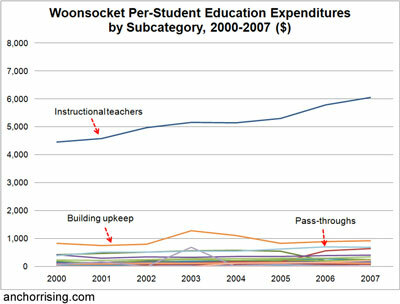 Certainly, none can say that Woonsocket teachers have been leading the state in expanded remuneration, recently. However, neither can one say that they “haven’t had a raise in five years,” which is what RI Federation of Teachers President Frank Flynn declared at a labor presentation at the high school, last week. That such a statement sounds credible at all is an indication that the discussion of public-school teacher pay has been distorted. Most of the ways in which teachers’ salaries go up, automatically or otherwise, are not considered raises, even though most private-sector employees would recognize them as such. The most significant raises that teachers get throughout their careers are the step increases that apply annually to their first decade of employment. By the three-year contract covering Woonsocket teachers beginning in the autumn of 2010, those increases are as shown in the following table. Note: Because step 10 is the last step, not all 351 teachers currently on it received their final increase within the last two years. (An estimated 42 of them have.) They do, however, become eligible for longevity bonuses beginning the following year. Assuming no new hires outside of the first step, 145 teachers currently at step 9 or below received an average of a 5.8% raise over the last year, with 130 receiving an average of a 12.2% raise over the past two years, for a total two-year increase of $803,105. Longevity payments to teachers already at step 10 increased by an estimated $15,500 over the past two years. The total known and estimated step and longevity raises for the upcoming school year will be $645,499. According to their contract, on June 30, 2013, the 338 teachers with higher educational credentials than a bachelor’s degree will receive bonuses ranging from $1,471 to $4,553, currently on target to total $1,139,929. These increases compound (i.e., the increases received year one count three times, year two twice, and year three once) to equal $4.7 million. For example, a teacher who finishes his or her seventh year on the job with half of the credits required for a master’s degree ends has earned an annual $53,070 during the school year. While on sabbatical for the next year to finish the degree, he or she will be paid at a $28,501 annual rate. Upon returning, his or her salary will be $64,078, or 21.7% higher than his or her last full-time year of work. Teachers can also achieve increases in their pay by becoming department heads, coaching, or leading extracurricular activities. ← Real Hourly Earnings on the Decline, Due to Inflation, but RI Might Be Doing a Little Bit Better than U.S.
Certified personnel with 10-14 years of service, the last 5 of these years in Woonsocket, will receive $400.00; those with 15-19 years of service, the last 10 of these in Woonsocket, will receive $600.00; those with 20-24 years of service, the last 15 of these in Woonsocket, will receive $1,000; those with 25 or more years of service, the last 20 of these in Woonsocket, will receive $1,400.00. During the 2008-2009 school year and thereafter, people with 25-29 years of service, the last 20 of these in Woonsocket, will receive $1,700.00; 30 or more years of service, the last 25 of these in Woonsocket, will receive $1,850.00. It does go on to say that, "Years credited under the ERSRI for non-contractual substitute teaching time shall not be applicable toward the payment of longevity." Is that what you mean? That looks like it indicates that non-contract substitutes get credit toward retirement but not toward longevity bonuses. Is that what was given back? For the record, I should also note that longevity accounts for only $97,800 of my estimated total, so if it is added erroneously, the correction won't make much of a difference. Great job Justin!! Your data is supported by the NEA's own research study, "Rankings and Estimates" dated Dec. 2011. It says R.I. has the 2nd highest per student K-12 education cost in the country at $18,589 for the school year 2010-2911, and the 11th highest average teacher salary for the same school year. It also points out that R.I. had 4.4% fewer students enroll in the Fall of 2010 than were enrolled in 2009. This was the largest drop in K-12 enrollment in the whole country. The primary driver for K-12 education costs is teacher compensation. The state spends so much on elementary and secondary teachers that it has little left over for our institutions of higher learning. The same NEA report indicates R.I. spending for colleges and universities in R.I. ranks 48th in the country. That is a disgrace! The basis of your argument is that teachers are getting raises on steps. Steps also are STATE LAW because there are no promotions in teaching – a teacher is a teacher is a teacher. Everyone agrees a first year teacher should not be paid the same as an experienced 10 year teacher, so can you suggest an alternative to that system that does not involve promotions? This is the major flaw in your article. Also, to prove your point that Woonsocket has received many raises over time, you omitted the mere facts that the table of steps has not has any increases in 4 years and will not have one to the remainder of the contract expiring in June 2013. Approximately &frac12; of the teachers are on steps, and approximately &frac12; are on top step. The amount on top step do not get raises annually unless they trip into the longevity items as you mentioned, however there are 5 year intervals with no raises under those scenarios. The teachers on the steps, under the “teacher” job description get to start on first step at 57% of the salary of a top step teacher. Fair? Again, IT IS STATE LAW TO HAVE STEPS so by its very nature you give more money in the first 9 years. Can you suggest an alternative to that system that does not involve promotions? While your article appears factual to the general public, the flaws in your argument are apparent when you choose not to take state law into account and don’t offer any alternatives to that system that Woonsocket is bound by law to pay. Will the teachers have received raises in 5 years as of the contract’s end? No they have not because the steps have not changed in 5 years. Any other portrayal is biased reporting. Thank you for the comment; it raises a critical component of the discussion. I've responded via a separate post.